Also known as Lark’s head and ring hitch, the cow hitch consists of a pair of half hitches tied in the opposite direction. Besides the procedure shown below, it can be tied using loops. It is mentioned in The Ashley Book of Knots. It can fix loops of cable to the backs of pick-up trucks during shovel moves. It is useful when you have only the end of a long rope available. 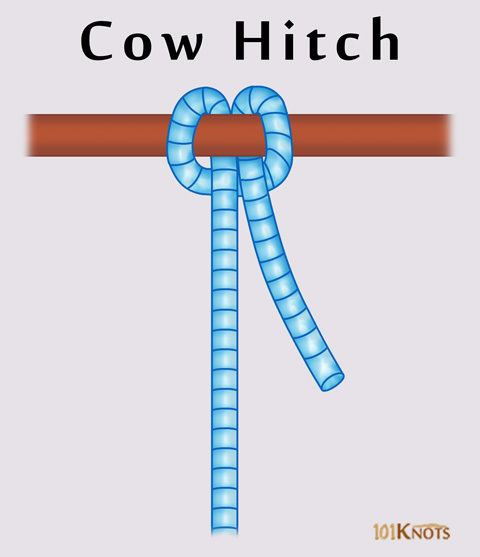 Cow hitch with a better half – It has a greater rope efficiency and is used to tie an eye sling to a tree. It requires less monitoring as it is more secure. Cow hitch variant knot – The modified version is stronger. 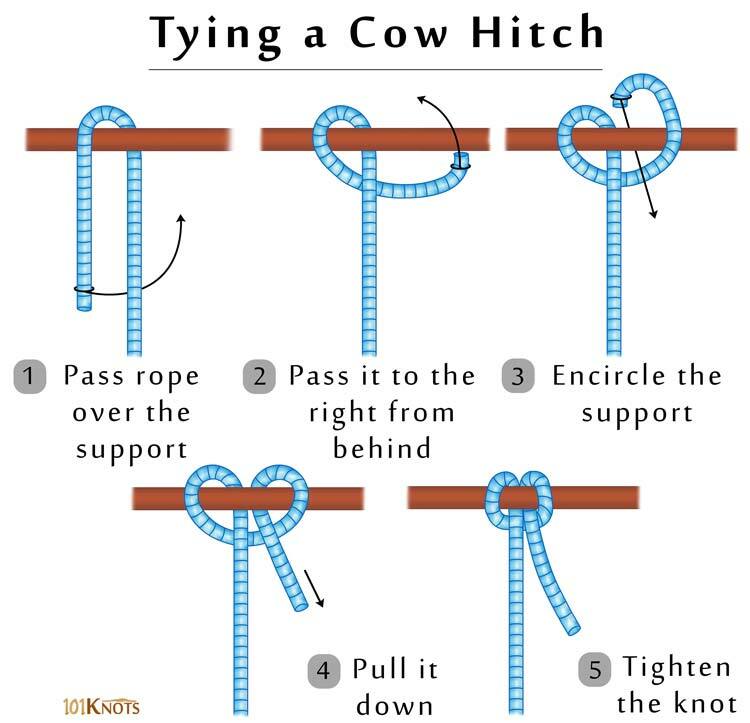 Double cow hitch – For tying to buckles. Pedigree cow hitch – The working end is tucked inside the turns for added security. Reinforced cow hitch – Offers a better grip and increased security. Can fail if equal tension is not applied at both the standing parts of the rope. Lanyard hitch – Though has a similar look, it bears a difference in the way it is tied. Clove hitch – The 2 half hitches are tied in the same direction. Girth hitch – Has a similar appearance but is tied with a sling loop. Timber hitch – Needs a greater length of rope. To secure an animal to a pole. To secure a lanyard and jib sheets to a rope. Works well in securing hardware like rigging pulleys and Port-A-Wrap to trees. Tied on arborist rigging pulleys for lowering large sections of trees. Making paracord water bottle holders and bracelets (cow hitch connections help in creating these).